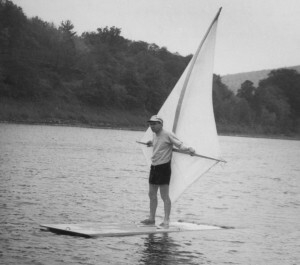 S. Newman Darby sails on his first sailboard in 1964. Darby's design for the board launched what became the sport of windsurfing. S. Newman Darby sails on his first sailboard in 1964. Darby’s design for the board launched what became the sport of windsurfing.